Simultaneously Dry Boots and Gloves! 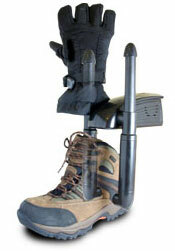 The DryGuy™ TRANSPORTER™ Dryer has rotating adjustable arms that telescope in and out insert easily into all size Ski Boots, Snowboard Boots, Inline Skates, Hockey Skates, Hiking Boots, Work Boots - as well as Gloves or Mittens. The boot dryer silently moves warmed “Forced Air” to quickly remove warmth stealing moisture. The TRANSPORTER™ helps reduce latent bacterial and fungal growth eliminating stink while encouraging dry, comfortable, healthy hands and feet. Pre-warmed boots and gloves (in as little as 15 to 20 minutes) improves circulation and promotes proper fit. Damp items resulting from normal daily use dry in 30 to 60 minutes. Washed, spun dried, gloves and mittens dry in 4 to 5 hours. Measures - 6.5" X 2.5" X 2.25"
It works ok, but it tends to take a long time to really dry boots and takes even much longer for gloves. It doesn't seem to work well for gloves because there is only one blower for each glove, but it should really have the blower for each finger of gloves.